This article discusses an architecture approach and roadmap to developing an infrastructure based on wireless technologies as a strategic component to unlock the potential of fast developing Information and communication technology such as the Internet of Things and mobility in production plants. This proposal implements an add-on philosophy, which means that all the industrial communications with a high demand on reliability continue to be conducted with the traditional installations, while everything additional not related to core process control task such as asset monitoring runs over a second technology path. The proposed architecture provides an industrial communication infrastructure that delivers enough bandwidth for implementing innovative applications while utilizing the installed base of the robust and reliable 4-20 mA technology, which still excels in terms of simple planning, straightforward construction and robustness against electromagnetic interference. Key requirement is a coexistence between the two approaches and a clear definition of boundaries throughout the lifecycle to prevent misuse of the wireless infrastructure for tasks that are process control or even safety related. A clear separation of the wireless infrastructure from the conventional installation needs to be implemented in order to prevent uncontrolled feedback on the process control part. 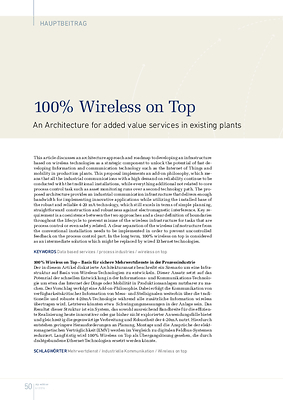 In the long term, 100% wireless on top is considered as an intermediate solution which might be replaced by wired Ethernet technologies.